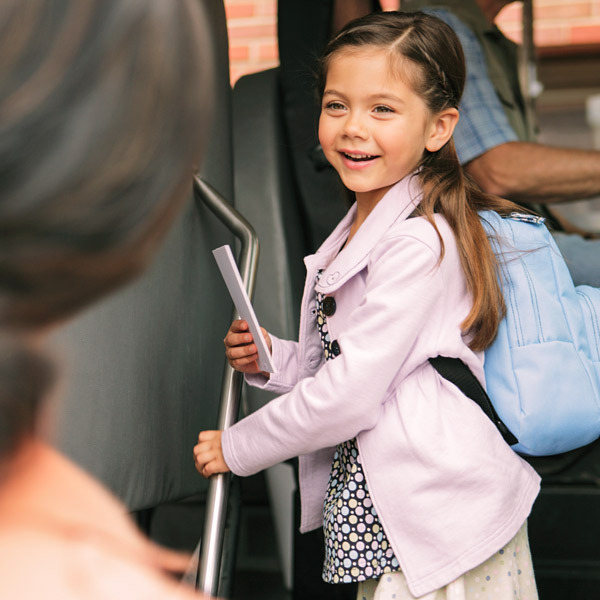 Sending a child off to school is at least as stressful for the parent as it is for the kid. (Ok, it depends on the kid.) With all the paperwork, chores, and errands involved, it’s easy to miss those fleeting moments that would make perfect memories—which is a shame because those moments happen all the time during the back-to-school season. Want to do something about it, but don’t know where to start? Read on for the Hallmark Photo Studio’s list of must-capture moments to start the school year right—and remember it forever! Start with those new school supplies. Get creative: arrange objects by color or in the shape of a number (your child’s grade, for instance). You can lay them out on a solid-colored blanket, sheet or carpet so all the items pop. Then snap a photo. Just like the school supplies, lay out the first day of school outfit. Include shoes, accessories, backpack, lunchbox, pocket contents, etc. Then take a picture. Find a favorite spot outside, where you think you will be able to take a picture each year. Have your child hold a large cardboard number signifying his or her grade year. (Buy a pre-cut number at a craft store or cut one out from cardboard and spray paint it.) At the end of the year, all the kids in your child’s classroom can sign the large number and you can display it as a memento. Find a place in your house to mark your child’s height at the beginning of the school year. At the end of the school year take a picture of your child standing next to the mark you made at the beginning of the year. Set up a tripod so you can jump into a photo with your kids. At the end of the year, take another photo in the same spot to see how much you’ve changed. Yes, you change, too. Your kids will appreciate looking back and seeing all your changes (hairstyles, outfits, etc.) when they’re all grown up. This can also be great motivation to stay in shape. Notice little things, as busy as it can be those first few days. Document them with your cellphone camera—you can always organize the photos later! Your goal is to tell the story of the start of a new school year. Take pictures of lunches, climbing onto the bus, walking with friends or siblings, their first report card, graded paper or art project. Take your camera to back-to-school night and snap some pictures of your child’s classroom, desk and things they’ve contributed to the classroom walls. Be sure to get a snapshot of your child’s teacher! Keep backgrounds simple: Shoot in the same location to see how the school or your house changes as your child grows. If you can, turn off the flash: A flash can make backgrounds too dark or wash out faces. Avoid the noon hour when shooting outdoors: High sun makes for tough lighting challenges on faces. Instead, take your student into the shade of a tree or large building. Separate your child from the background: Put distance between your child and the backdrop, and avoid shooting right up against a wall or door. Get close and fill the frame: Your scholar is the story, so don’t be afraid to get in close. Put that camera phone to good use: Smartphones make it much easier for you to capture memories in the moment. Experiment with apps that give your photos fun effects.